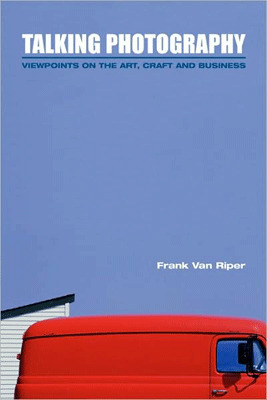 “Award-winning photographer and Washington Post columnist Frank Van Riper assembles a collection of his most outstanding popular columns to delight readers with a treasure chest of photographic insights” one reads on the back cover of this book. Okay then, let’s look what the author’s photographic insights are. It goes without saying that there are different ways of reading a book. From cover to cover is a possibility, to open it at random and start reading when and where you feel like it is another one. In the case of this tome I’ve opted for the second one. And I did indeed find “a treasure chest of photographic insight” that made me re-think some of my views. Good point, I find, but doesn’t reading photographs mean that we should think about, reflect on, ponder what we are looking at instead of simply be victims of our unsconscious? Is Selkirk right, does thinking limit our ability to enjoy photographs? I guess that if you want from photographs primarily enjoyment, he might be right, there are however lots of photographs (think of documentary, political propaganda etc) that are clearly meant to be reflected on. In fact, to reflect on them is conditional to enjoying them. Van Riper also points out that “nowhere in his book does King have anything to say about ‘equipment’. From my own conversations with him I know that he writes on everything from a computer to the back of napkins. Keep this in mind the next time you are tempted to think that your creative output would be doubled if you just spent the rent money on a better camera. Better you should spend a fraction of that total on a few more photography books so you can study the images therein to better use the camera you already have." Good advice, I'd say. Another piece is called “In Praise of Obsession”. Since I’ve never thought of obsession as being something positive (quite the opposite, actually), I wondered what this would be all about. Van Riper elaborates: “We as photographers, especially commercial shooters who are hired guns for every passing art director, event planner, magazine or ad agency, may think we haven’t the time for such artistic indulgence, especially when we face hard times and the need to make a living. Yet I suggest that the photographer who thinks this way is limiting him- or herself in a fundamental and important way. The project that speaks to us directly – that stays in the back of our minds at the end of a boring day of tabletops or assembly line headshots – is the one that will maintain our sanity in the humdrum of commercial shooting. Succumbing to obsession, I submit, is a way to stay sane.“ Great insight, isn’t it? “Photography, like painting, is largely learning how to see”, notes Van Riper on another occasion and continues, “and to grow comfortable with the equipment that lets us turn what we see into something tangible.“ It is such well put insights that I’m looking for in books. “Talking Photography” consists of 99 articles (including the introduction) and covers a very wide range of topics from interviews (i.e. Bruce Davidson, Frans Lanting) to reviews (i.e. Dorthea Lange’s Ireland, Edward Steichen: Diminished by his Success, Henri Cartier-Bresson and Brassai: Two Different Ways to Greatness) to technical tips (i.e. Photographing Artwork, Capturing Venice at Night) and more. What did I like best about this useful and recommendable tome? The nuggets that I encountered here and there and everywhere. Here are two additional examples. Number one: “Put simply: A painter can create an image from memory; a photographer cannot. For this reason photography has gained a reputation for truth telling (‘the camera never lies,’ though in fact the camera alway lies by translating a three-dimensional image into one of only two dimensions). Number two is a title and it still makes me smile: “Stieglitz and New York: A Town to Match His Ego.